Here is my now slightly battered copy of Mosquito which has travelled back and forth from home in Manchester to work in Buxton, in my bag for the past couple of weeks. My new years resolution was not to fall asleep on the train anymore, and to use the time to read instead. 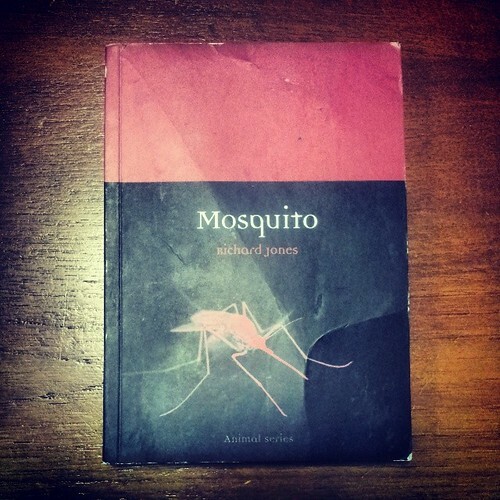 Mosquito was my first read of 2014. Having read and enjoyed the book I thought I’d add a review of my own from the perspective of someone at the other end of the dipterist spectrum to the Curator of Diptera, in the Department of Entomology, at the Natural History Museum. Someone who has only recently discovered the joys of flies (me). It’s a book about mosquitoes, you can guess as much from the title, but one of the things I liked most about this book was that it reaches much further than its humble subject. You cannot tell the story of mosquitos comprehensively without also telling the story of humans & malaria. As a result these chapters are as much about people facing a problem bigger than their understanding and abilities to conquer, and the story of how they went about getting organised enough and clever enough to do so. The trials and errors, our scientific progress, dead ends and moments of inspiration paint a picture that you could appreciate even without an interest in insects. The human race was faced with a problem, here’s how they went about tackling it. But for the invert enthusiasts contained also is such a comprehensive array of trivia that it’d be a challenge comparable to the that of scientists vs. malaria to find a piece of mosquito trivia that isn’t in this book. There were things I’d always wondered that I now know, and in a weird way I’m almost looking forward to the next time I get bitten so I can observe the process I now understand in action. I wonder if I read Richard’s other book in the series on head lice if I’ll feel the same. I hope you enjoyed this blog. I’m a mature student at Manchester Metropolitan University studying Ecology & Conservation. Currently on a sandwich year work placement at an ecological consultancy. I blog about all things ecological. I enjoyed your blog and I do think you should read Richard Jones’s next book in the series as you do have personal experience in this. Don’t you remember the joys of the “nit comb” !!!!! !